2.35 p.m. R5 5 Savile Row (4 h Makfi – Fleece) – Leith Innes; has continued to train well since winning the $60,000 Hallmark Stud Handicap (Listed, 1200m) on Boxing Day at Ellerslie, with Innes aboard. 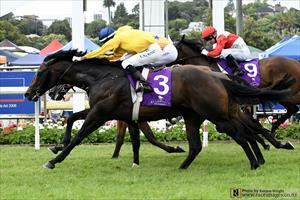 Three times group one placed (second in each), he is ideally drawn (5) in the $200,000 Thorndon Mile (Gr. 1, 1600m). A talented athlete, he warrants plenty of respect in a top field and current third favourite in an even betting market. Fixed odds: $6.20 & $2.05. 4.22 p.m. R8 15 Za Za Gabor (3 f O’Reilly – Zaza Top), T: Moroney/Gerard, Matamata. J: Samantha Collett; produced another very good effort for second in the Maiden 1600 metres on 29 December at Ellerslie, having found the line solidly for fourth on the same course in the Maiden 3YO Fillies 1400 metres on 13 December. Up in class to contest the $70,000 Desert Gold Stakes (Gr. 3, 1600m), she has the addition of blinkers and should go well with a smooth trip from barrier eight. Fixed odds: $28.00 & $7.50.